in Beaumont and Southeast Texas! Don't Be Fooled By Cheap Imitators!!! Whether you are looking for a margarita machine for a small party or want to provide frozen drinks for a large event, we can fill your needs. We deliver to you door, on your schedule and provide all that you need to make your party or event a rousing success. Take a look at the Rentals page to see what Full Service is all about! Where can you use a margarita machine rented from Mr. Margarita??? Fund raisers, non-profit benefits, corporate events, employee recognition, grand openings, promotions, Weddings, Birthday Parties, kids & children parties (non alcoholic), adult themed parties, anniversaries, NEW YEARS EVE, Shrimp Boils, Fish Fries, Cook Offs and BBQ?s, holiday party, FOURTH OF JULY, bar mitzvah or bat mitzvah, baby shower or bridal shower, retirement, MEMORIAL DAY WEEKEND, promotions, church events, trade shows, CHRISTMAS, customer appreciation, charity events, graduation parties? The possibilities are endless! How much is it to rent a margarita machine from Mr Margarita? Our prices vary throughout the year due to availability and seasonal demand. Our average price is $135.00, which includes a Mr Margarita margarita machine, , extension cords our 5-gal. pre-measured mixing bucket, a heavy duty Rubbermaid cart. We will also set it up for you. Each additional bottle of mix is billable at $20.00 as used. If we over estimate the amount of mix we deliver, any unopened bottles are returnable at no charge. Typically we leave 1 extra bottle as a "just in case" at no charge unless used. Therefore, it is better to be long than short on mix supply. We also offer free local delivery and pickup (additional charge for delivery outside of our local delivery area). Are the machines easy to use? Yes indeedee! At delivery, each easy step of machine operation and refilling procedures are covered verbally to ensure a successful event Easy to follow instructions are always left behind for reference We mix your first batch and show you how to use the machine! NO BARTENDER REQUIRED, NO CO2 CARTRIDGES, NO BLENDER, NO ICE, NO MESS! How many drinks does one batch yield? One batch of margaritas makes about 80 eight-ounce drinks. The machine will hold about one whole batch (5 gallons of mix). Our experience shows that usually half or more guests drink the frozen drinks even if you offer a choice. We recommend one batch for every 25 frozen beverage drinkers. Extra margarita mix is $20.00 and refundable if unopened. How long does the first batch take? Indoors about 30 minutes, outside on warm days, up to an hour. There is no waiting between batches because you add to reservoir when the mix-low light comes on. We recommend that if you use a machine outdoors, you will get the best performance if you keep it in the shade. Who provides the liquor and how much will I need? The customer provides all liquor. A medium strength batch of margaritas calls for three liters tequila, and a half-liter triple sec. Check out the Recipes page to judge other mix ratios. Are other kinds of drinks available? Absolutely. You can serve Strawberry Daiquiris or Margaritas, Pin Coladas, Raspberry Ritas, Mango Ritas, Banana Daiquiris, Peach Bellinis, Louisiana Hurricanes, Lemon Freeze, Tropical Punch, Mudslides or Rum Runners. All can be made as non-alcoholic fruit slushies FOR KIDS! How far in advance should I reserve my machine? We recommend 4 weeks and longer for holiday seasons and traditional party dates like Halloween and New Years Eve. One machine will delivery frozen drinks for up to 75 frozen beverage drinkers. 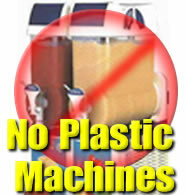 If more guests are expected, a second machine is strongly recommended otherwise the machine will not perform properly. $50 NON-REFUNDABLE DEPOSIT DUE AT TIME OF CONFIRMED RESERVATION. ADDITIONAL MIXES ARE LEFT AT NO ADDITIONAL CHARGE UNLESS USED.